Bandhej is the art of the tie and dye in Gujarat. Traditionally, each village had its own typical colour schemes and designs, depending on the religious and social customs of the place. 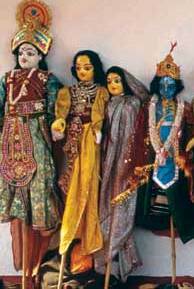 The centres where the craft was practised include Jamnagar, Anjar, and Bhuj. This craft now faces severe competition from the machine printing of bandhej designs. Bandhej requires the cloth to be dipped into a colour-bath of choice, after which the cloth is folded to a quarter of its size. The area to be worked upon — a sari border, pallu, or the body of the sari — is separated, and then is tied with strings to form various designs. The designs are made from a combination of small dots and circles. The artisans makes the designs without the help of coloured strings or blocks. The tying of the border and the discharge of the colour is called sevo bandhavo. The borders are broad, and are worked both in complementary and contrasting colours. The designs are composed with minute attention to detail. An inexhaustible number of colour schemes are used. The colouring technique involves the lightest shade being worked in first, after which this is tied and a darker colour is inserted. This is done till the darkest shade is reached. The last colour the cloth is dipped into is the colour used as the background. The colours used commonly include red, black, golden yellow, and maroon. The quality of the bandhej can be determined by the size of the dots: the smaller and closer to the size of a pinhead the dots are, the finer is the quality of the bandhej.